A beautiful Saturday in October---sunshine, blue skies, chilly temperatures, and time spent with those I love. The day started early, no time for morning paper and coffee. I grabbed an X-large cup from the local Sheetz and headed off to cheer for Emma in her soccer game. I have not seen the girls in several weeks and I was sure missing them. Emma's birthday is today--she is 6 years old. Happy Birthday sweet girl!!! I pulled in the parking lot and Kate came running. After lots of hugs and kisses I realized how much she had grown. I am less than a head taller than her now. I have said it before and I will say it again--time sure has a way of flying by. Emma was great in her game. It was such fun to watch all of the kids. Both teams really played hard. After the game we headed for the little town where with girls live. It was Apple Fest Days. To me there is nothing like a small town Autumn festival. The girls are holding cookies that we bought from this most adorable bakery called the Sweet House. This bakery is filled the yummiest sweets and all of that vintage charm that I love. I wanted to take pictures of the inside but it was much to crowded. I will be visiting again real soon so I will have to take pictures then to share with you. How do I know that I will be returning soon you ask?........because I am addicted to the wonderful potato chip cookies that I purchased. My Grandmother used to make these for me when I was a little girl and it brought back so many memories. If you have never tried a potato chip cookie take my word for it they are delicious. There is nothing like festival food---hot dogs, hot sausage, chicken on a stick, steak hoagies and french fries dripping with ketchup. It seems that Nancy's mother used to make and sell jewelry when Nancy was a little girl. That box was filled with supplies and finished pieces. When she opened the lid I actually gasped. She said "I knew you would love it"
There are lots of little pieces just waiting to be completed with these beautiful crystals. I have never tried my hand at jewelery making before, but I am so excited to give it a try. If any of you have any suggestions on what glue to use or any other tips I would love to hear from you. 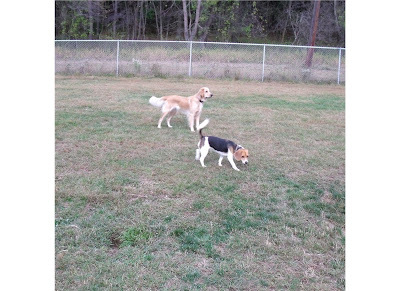 After being gone for the majority of the day, the dogs were so excited when I finally arrived home. They were so full of energy they were getting themselves into trouble. 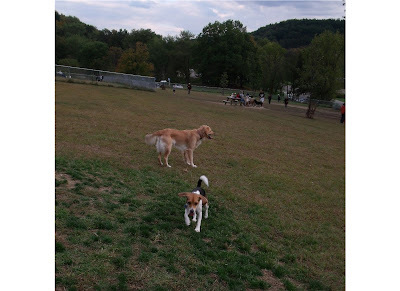 The day was still so beautiful I decided to visit the local park and let Sassy and Mabel play in the off lead dog park. The beauty of the day, surrounded by loved ones---what a perfect way to spend a Saturday in Autumn!!! It sure looks like you had a wonderful day and I'm sure the girls were thrilled that you came. I have heard of that bakery...if you need someone to go back with you, I'm your girl! I have a recipe for potato chip cookies...talk about decadent! Pretty soon Nancy will be calling you to come during the week. She does have some interesting things...still no children's books, huh? I am now a follower...welcome to our merry band of tag swappers! Hi, Mimi! Thanks for your visit--so wonderful to meet you! Loved reading your lovely autumn post--so filled of lovely things! WOW! What a lucky find--all that wonderful crystal for jewelry! I love making jewelry--haven't done it in a while, but it's so much fun! Hope your Monday is fabulous and I'll talk to you soon! What a super fun Post!! Adorable girls! And "be still my heart", regarding the old jewelry. The best glue out there, in my opinion, is E-6000. But be sure to use it in a well ventilated area. You can find it at Walmart, Michael's, HL, etc. Hi Mimi, Thanks for your visit. We have been having beautiful weather. Chilly mornings but the afternoons warm up very nicely. You need your sweater in the evening when the sun goes down. We have already dropped to 52 degrees, Your girls look like they are really enjoying themselves and the cookies bring back memories. I loved your Halloween things from the previous post. Have a great day. Your Missouri Friend. Hi, Mimi! It's been so good to hear from you (on my blog) and this is the first chance I've gotten to stop by yours in a long time, too. Sounds like you had a fabulous Saturday. I've never heard of Potato Chip Cookies, but may have to look for recipes. I'm definitely intrigued! And -- that box of goodies from the garage sale? I can see why you would've gasped! Can't wait to see what you do with all your new treasures! Hope to come back soon and catch up... only had time to read one post tonight. Hope you're having a great week!